The 3 month Euribor interest rate is the interest rate at which a panel of banks lend money to one another with a maturity of 3 months. 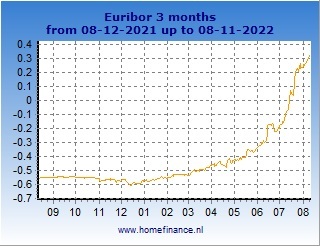 On this page you can find the current 3 month Euribor interest rates and charts with historical rates. For more information on Euribor in general and the other Euribor rates, click here. In the following tables we show the latest 3 month Euribor rates. The left table shows the rates over the last 10 days. The table on the right side shows the first available rate of every month over the last 10 months. The first rate of every month can be used by banks to determine their interest rates on products like mortgages and savings accounts. In the following charts we show the history of the 3 month Euribor rate. 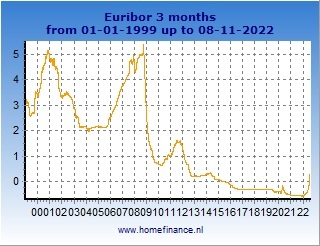 On the left side you find a chart with the rates from 1999, the starting point of the Euribor rates. The right chart shows the rates in the latest 12 months.